Summer is right around the corner, and if the idea of showing more skin has you feeling a little, well, exposed, drinking more water — in place of sugary beverages — can help you slim down and tone up. Many Americans are chronically dehydrated and they don’t even know it. In fact, a study found that 76 percent of Americans aren’t well hydrated. And even slight dehydration can dampen your metabolism, making it harder to lose weight and it makes it harder to exercise and get the most out of your workouts. SodaStream is a tool proven to increase water consumption. In fact, SodaStream owners consume 43% more water than non-owners. To help you sip smarter, five AFH fans will win a SodaStream Power. 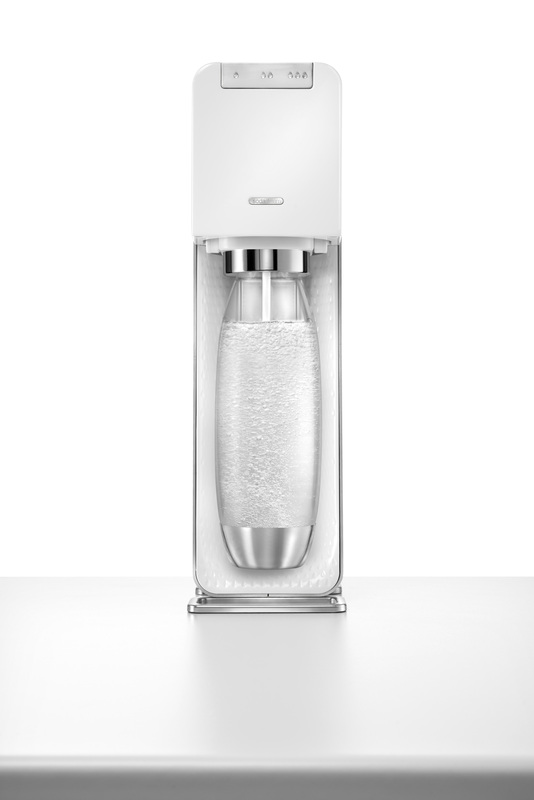 Designed by Yves Béhar, the SodaStream Power is an Automatic Sparkling Water Maker that offers a more convenient solution for carbonating water with touch button activation as well as quick snap-lock bottle insertion. An eco-friendly at-home solution to bottled beverages, SodaStream Power allows users to choose their ideal level of fizz with convenient buttons for three distinct carbonation levels. The Power’s sophisticated and sleek design with metal accent fits nicely into any home or office décor. The Power requires electricity and must be plugged in. It comes in white or black. Leave a comment below telling us which article you shared. Shared the banana article because I was recently told too many bananas will cause K overdose. I didn’t know smelling them can suppress appetite! I shared “Are Bananas A Diet Wrecker?” with my husband. He eats a lot of bananas. I shared eat These Purple Foods. I liked APH. I shared the Eat These Purple Foods to Improve Your Health on Facebook. I shared the Eat These Purple Foods to Improve Your Health on Twitter. I shared the Eat These Purple Foods to Improve Your Health on G+. I shared the “Are Bananas a diet- Wrecker” with my sister because we always have discussions on how many Bananas you should eat because they are so high in sugars. Somehow my comment posted weird. I shared the best diary milk article from December of last year. I like cow milk, but I know a lot of my friends have an intolerence, so I thought this would help them. I shared the article: Fuel Your Workout With These Great Treats with my daughter who takes her workouts seriously! I shared the Falafel Burger on Facebook. I shared the Why Chocolate Milk Is the Perfect Recovery Drink on Twitter. I shared the Why Chocolate Milk Is the Perfect Recovery Drink on G+. I liked on Facebook and pinned on Pinterest. I shared the Grapeade recipe with my adult daughter since we both have given up soda for much healthier options in addition to lots of water. Love it! I shared the “How Much Water Do You Need?” article with my husband since we have heard so much conflicting information. We are going to calculate our needs using all three methods and averaging them! Such great resources – Thanks! Thanks for sharing this. I want to win this sodastream.